Starting a new blog is so exciting! You’re on a new adventure. You’ve got tons of ideas. But there are a lot of things to think about when you start a blog. It’s a tad bit more than pushing publish. That’s where the Start a Blog Checklist comes in. The checklist will cover everything you never knew, you never knew. If you check everything off the list, your new blog will be set up for success from the beginning. Your blog is going to be as sweet as pie when we’re done. Everyone will be coming back for a second slice. 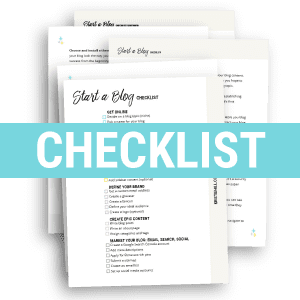 I’ve split the checklist up into five main sections: Getting online, building your website, defining your brand, creating epic content and marketing your blog. 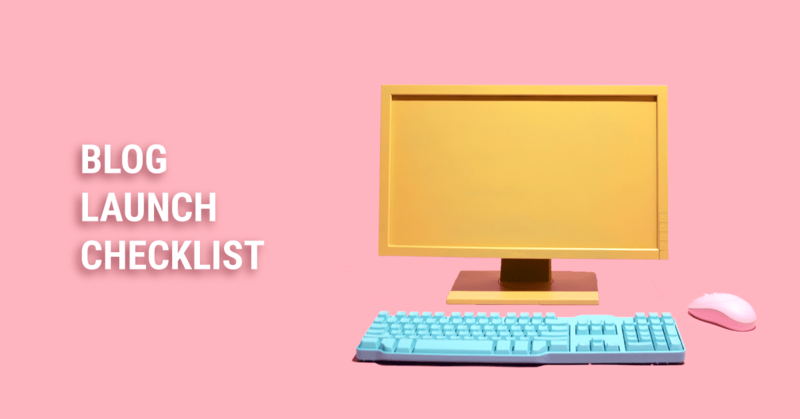 With the checklist in hand, setting up your blog is going to be easy like Sunday morning. Before you set up your blog, you’ll need to do a little ground work. Once you have a general idea of what you want to blog about, you can decide on a name and purchase hosting for your new blog. Getting hosting is only the first step in setting up your blog. Now you need to build it! This section covers setting up WordPress, getting comfy with WordPress, making your blog look pretty, essential pages, spam protection, Gravatars, favicons, analytics and more. Yes, you read that right. A blog is a brand. If you want to profit from your blog, you need to think of your blog as a brand and a business from the beginning. Content matters. It’s the bloodline of your blog. It needs to be good. Learn how to format and organize your blog posts. This is the fun part because you get to create and do your thing. Writing a blog and then having no one read it soul-crushing. I don’t want that to happen to you! The checklist covers setting up social media accounts, a newsletter and optimizing for search engines! No need to fret over the techy stuff. Many of the checklist items links you to a step by step tutorial, simplifying the technical aspects of starting a blog. Get your free checklist and guide! I want to do more than just give you a list of things to do (I’ll save to do lists for my husband). 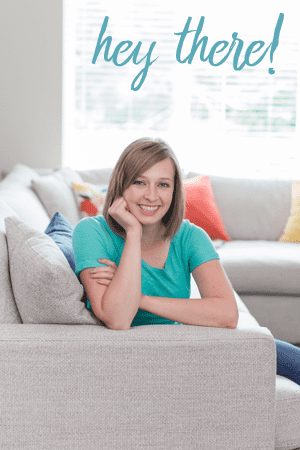 I want to help you actually tackle the New Blog Checklist! Sign up below and I’ll send you the PDF email checklist and we’ll work towards checking things off the list. You can download it, print it off and hang it on your fridge. Or just use it on your computer. 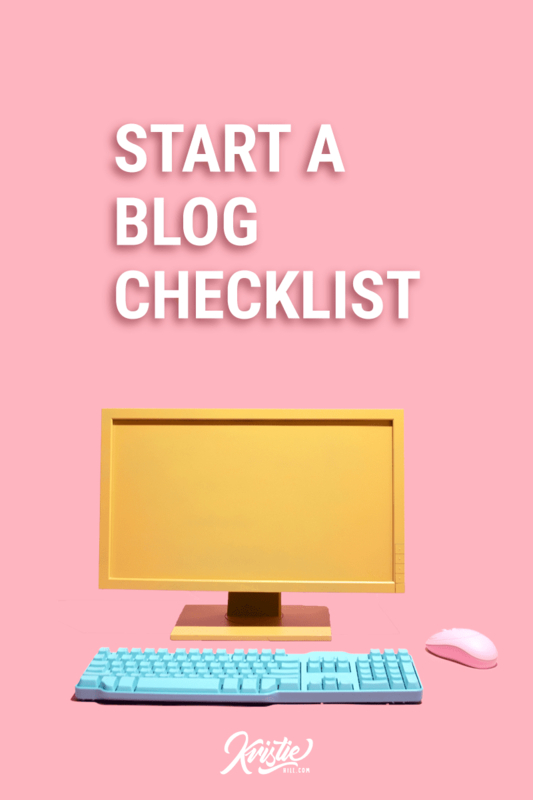 Make sure your blog is set up like a pro with the Start a blog Checklist! 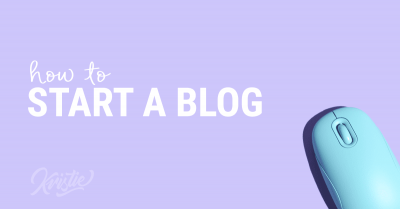 Subscribe to the Start a Blog Series to receive regular updates and tips about starting – growing your blog & get instant access to the Start a Blog Checklist. 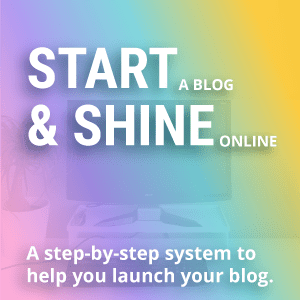 It covers all the things you need to set up and run a successful blog! Good luck starting your new blog! Let me know if you have any questions along the way. Happy to help! Save it to your blogging board on Pinterest! Hi Kristie, I requested your checklist twice (once on my ph and once on my laptop). Have not received it. Not sure what the timeline is? Hi Jody! I see that you requested the checklist and looks like you’ve received the first email from me. Perhaps check your spam folder? Sometimes it sneaks in there. Thank you for your insight on this topic. I am new to blogging and can’t wait to get going just need more information to keep motivated and going. You got this Lina! You’re right, you just need to jump in and get going! I’ll send you some emails to help you out. Glad it’s useful for you Shameer! Hey Kristie, it’s a wonderful read. It is really useful for a novice and equally beneficial for an experienced blogger who sometimes forget to adopt what is mandatory. I spent quite a good time reading your checklist and find it really worthy. Thanks for sharing. You’re welcome. Thanks for taking the time to check out the list. That’s a very useful checklist for a newbie blogger who just going to start their own blog. This checklist is very important for any blogger. Thanks for sharing Kristie for such types of information. This sounds like a great checklist for anyone who is just starting a blog. I’ve started several and just started my current blog about 10 months ago. You’re definitely right, it’s exciting to start the blog. What no one tells you is how much work goes into growing the blog. This time around, I’ve picked a niche that I love. Unlike the last several blogs, I only entered those niches for the money. I love working on my blog and it doesn’t feel like a chore. I personally think that’s one of the biggest things to think about when starting a blog. Choose something that you’re passionate about. Hopefully, what you’re passionate about can be monetized. I’ll be sure to share this checklist with others. I have not doubt that it will help people who are just getting started.